Our work centers on understanding how large populations of neurons in the brain perform computations and represent intention. We use these insights to develop high-performance, robust, and practical assistive devices for people with disabilities and neurological disorders. This is meant to be an accessible overview of recent science surrounding neural population dynamics in motor cortex, techniques for inferring latent factors from neural population activity, and implications for BMIs. All students joining the lab would first need to be accepted by one of the relevant graduate programs at Emory or Georgia Tech (Biomedical Engineering, Neuroscience, Electrical Engineering, Computer Science, Bioengineering, etc). It is not possible to join the lab until a student is first accepted to a graduate program. Grad school is complex, and choosing a great mentor is critical for your career. Do your homework! A helpful starting point is Ben Barres’s article, How to Pick a Graduate Advisor. Here’s a page from the Shackman lab with great tips and resources on the grad school applications process. [2019-03] Congrats to Mia Paletta & Sunny Wang! These two talented undergrads each received funding from Georgia Tech’s President’s Undergraduate Research Awards. Sunny’s PURA Travel Award will support her upcoming presentation at the National Conference on Undergraduate Research, and Mia’s PURA Salary Award will support her research in our lab over the summer. [2019-02] Honored to be selected as a 2019 Research Fellow in Neuroscience by the Alfred P. Sloan Foundation! Thrilled to join this amazing group of scholars. Also proud to represent the Coulter Department of Biomedical Engineering as one of two Sloan awardees this year, alongside Prof. Eva Dyer! [2019-01] Very thankful to be named a K12 Scholar as part of the Interdisciplinary Rehabilitation Engineering Research Career Development Program through the National Institutes of Health (NIH). This is a wonderful opportunity to receive mentorship in the best ways to use our techniques to work on challenging problems in rehabilitation engineering! [2018-12] Had a wonderful visit to the University of Georgia to present our work using deep learning to uncover dynamics from neural population activity. Thanks very much to the UGA Deep Learning Group for the invite! [2018-11] Congratulations to Tony Corsten, first student to graduate from the lab! Tony just defended his Masters thesis entitled, “A novel device for precise training and perturbing of motor cortically driven forelimb behaviors in the rat“. Tony gave an excellent presentation of stellar work, and I’m truly honored to have contributed to his training and development over the past 2 years. Very proud of him, and excited to see him move on to do great work as part of Randy Trumbower’s lab at Spaulding Rehabilitation Hospital at Harvard. [2018-11] Our lab presented three abstracts at the 2018 Society for Neuroscience conference in San Diego. Really pleased by the response and feedback. Congrats to the students and postdoc! [2018-10] We just published our first paper, a review article in the Journal of Neuroscience: “Latent Factors and Dynamics in Motor Cortex and Their Application to Brain–Machine Interfaces“. 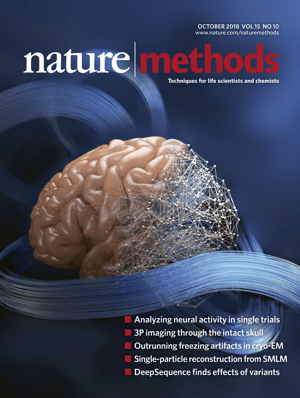 We hope this is an accessible overview of recent science on neural population dynamics in motor cortex, techniques for inferring latent factors from neural population activity, and implications for BMIs. [2018-06] Yahia Ali, an undergraduate in the lab, was selected for the Charles I. Hancock Endowed Research Award in Neuroengineering from the Emory / Georgia Tech Biomedical Engineering Department. Congrats Yahia! [2018-06] Enjoyed giving an invited talk on our deep learning work to understand neural population dynamics at Machine Learning in Science and Engineering 2018 at Carnegie Mellon University. [2018-05] Our minisymposium proposal, Latent Factors and Dynamics in Motor Cortex and Their Application to Brain-Machine Interfaces, was accepted for the 2018 Society for Neuroscience Annual Meeting. Dr. Pandarinath will chair the session. Other speakers: K. Cora Ames (Columbia), Eva Dyer (Georgia Tech), Jonathan Kao (UCLA), Ali Farshchian (Northwestern), and Abigail Russo (Columbia). Congrats to all the speakers! [2018-05] Lahiru Wimalasena (graduate student in the lab) gave a poster presentation at the Society for Neural Control of Movement Meeting, entitled “Modeling neural population dynamics in motor cortex leads to improved kinetic decoding in an unstructured motor task” (one of two presentations from our group). [2018-04] Dilara Soylu (undergraduate student in the lab) won 3rd place at GT’s Undergraduate Research Symposium for her poster presentation entitled “Optimizing Deep Learning Models for Limited Precision Architectures”. Congrats Dilara ! 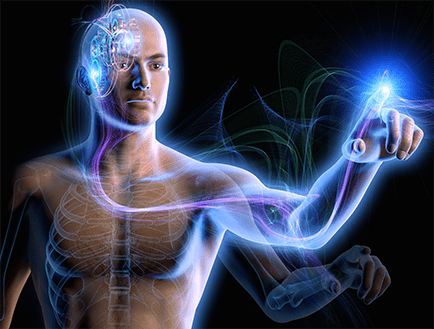 [2018-03] Had a lot of fun participating in the Emory Neuroethics Seminar Series, “The Future Now: NEEDs (Neuroscience and Emerging Ethical Dilemmas).” Gave a seminar entitled “To be implanted and wireless” (click for excellent writeup by Nathan Ahlgrim). [2018-02] Congrats to Feng Zhu (graduate student in the lab) for receiving a travel award from the IEEE Brain Initiative to attend the COSYNE 2018 conference! [2017-12] Yahia Ali, an undergraduate in the lab, and Siva Manivasagam (Rozell Lab, GT ECE), were selected for a prestigious University Interdisciplinary Research Award for Spring 2018 from Georgia Tech. Congrats Yahia and Siva! [2017-11] New papers: “A comparison of intention estimation methods for decoder calibration in intracortical brain-computer interfaces” (IEEE Transactions on Biomedical Engineering). 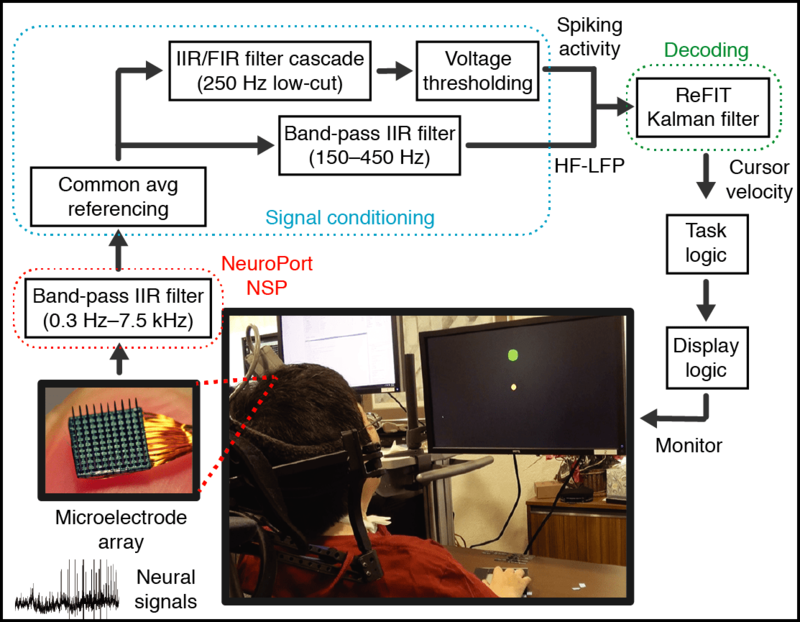 “Rapid calibration of an intracortical brain computer interface for people with tetraplegia” (Journal of Neural Engineering). “Feasibility of automatic error detect-and-undo system in human intracortical brain-computer interfaces” (IEEE Transactions on Biomedical Engineering). [2017-06] A preprint of our manuscript on applying deep learning techniques to uncover neural dynamics is now available on BioRxiv: “Inferring single-trial neural population dynamics using sequential auto-encoders”. [2017-03] Yahia Ali, an undergraduate in the lab, was selected for a prestigious President’s Undergraduate Research Award from Georgia Tech. Congrats Yahia! [2017-01] Our paper “High performance communication by people with tetraplegia using an intracortical brain-machine interface” was accepted at the journal eLife. [2017-01] Our abstract “Precise estimates of single-trial neural population state in motor cortex via deep learning methods” was accepted at Computational and Systems Neuroscience (Cosyne) 2017. [2017-01] Our paper “Signal-independent noise in intracortical brain-computer interfaces causes movement time properties inconsistent with Fitts’ law” was accepted at the Journal of Neural Engineering. [2016-11] Our paper “Feedback control policies employed by people using intracortical brain-machine interfaces” was accepted at the Journal of Neural Engineering. [2016-08] The preprint of our paper, “LFADS – Latent Factor Analysis via Dynamical Systems,” is now available.